Because today is the birth­day of Charles Dar­win, I have browsed the essays of Stephen J. Gould to find some­thing to write about. Gould was an evo­lu­tion­ary biol­o­gist, with a great inter­est in the his­to­ry of sci­ence. He is one of my favorite authors. We have one book of him, a yel­lowed Pen­guin edi­tion of ‘Eight Lit­tle Pig­gies’ and I always keep it at hand. Today I noticed an essay about Darwin’s first pub­li­ca­tion: The moral state of Tahi­ti. 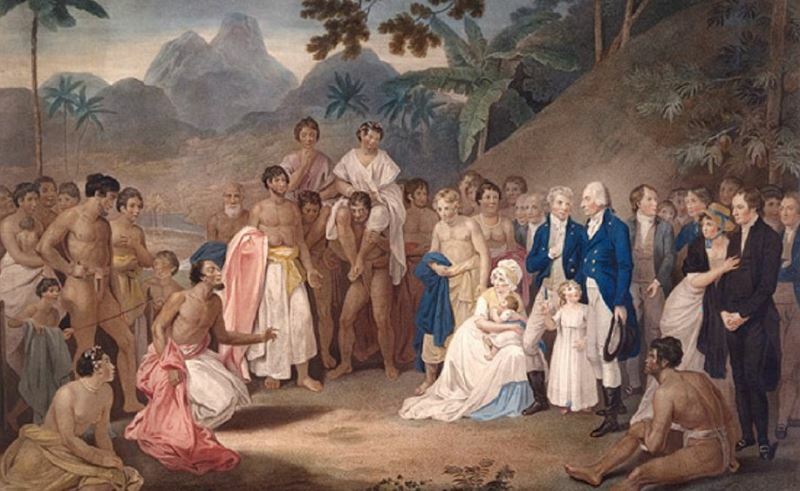 This is an arti­cle in which Dar­win and Robert FitzRoy (cap­tain of the Bea­gle) defend the white mis­sion­ar­ies were try­ing to teach some civ­i­liza­tion to the inhab­i­tants of the island of Tahi­ti. It was writ­ten in 1836. I have not read the arti­cle itself, but I start­ed read­ing The Descent of Man, a book by Dar­win. After a few pages, I quick­ly shut the book again, because I could not bear the undis­guised racism. In brief, Darwin’s vision was that there is a scale of devel­op­ment with Cau­casians on top, the apes at the bot­tom and all oth­er human ‘races’ in between. Today we know that the con­cept of ‘race’ is a cul­tur­al term and does not exist bio­log­i­cal­ly. This makes any form of racism unac­cept­able. In Darwin’s time, how­ev­er, racism was the sci­en­tif­ic stan­dard in Europe. As a result it was inevitable that the Euro­peans were behav­ing pater­nal­is­tic. This means that they saw the peo­ple on Tahi­ti as imma­ture chil­dren, who could not make the right deci­sions. For their own good, it was bet­ter that the white peo­ple were in con­trol. Gould right­ly says that the vision of Dar­win is shaped by the cul­ture in which he lived and that we have to judge him on the grounds of the moral choic­es he made with­in that world­view. This shows us that he was a fierce oppo­nent of slav­ery. The fact that accord­ing to him, these peo­ple belonged to an infe­ri­or race, did not mean that it was right to exploit and abuse them. It some­times seems as if all these ideas are sit­u­at­ed so far in the past that they no longer affect us. But Darwin’s arti­cle was writ­ten 180 years ago. On the scale of record­ed his­to­ry (start­ing 3500 BC), this is very recent. I think that we Euro­peans still have a lot of hid­den pater­nal­ism. In the Nether­lands, the tra­di­tion of Zwarte Piet is fierce­ly defend­ed as cul­tur­al her­itage. But when it comes to the time when this tra­di­tion orig­i­nat­ed, the Transat­lantic slave trade and col­o­niza­tion, we want to for­get about it as quick­ly as pos­si­ble. In this con­text, two Dutch MPs have made an inter­est­ing pro­pos­al: Open a muse­um about slav­ery and col­o­niza­tion in The Hague. Stereo­types can be bro­ken down through more inter­ac­tion with oth­er cul­tures and their past. BooksCharles DarwinDevelopment	Posted in Uncategorized.